There are so many factors which go into choosing spa space for rent. In this article we will try to help you muddle through the options and make a wise decision. Feel free to call us at (817) 823-7105 if you have more questions after reading this article. Let’s start with a simple one: choosing a salon booth rental near your home is always something to consider. No one wants to start out their day fighting traffic, and with the cost of gasoline constantly fluctuating, finding a salon booth rental close by is always a good thing. Then we move on to the “dollars and cents” consideration. What is the cost of each salon suites for rent you are considering? Spa rentals vary wildly from city to city and even within a city, so due diligence is called for. In order to find the best deal, it may well be necessary for you to call each spa rental company and pay a visit to each one. In a small city that may only be two or three visits; in a large city you could well spend a day or two in this undertaking . . . but it will be worth it in the long run. To give you something to gauge this all by, we are Salon and Spa Galleria serving the Greater Fort Worth area. Our spa rentals start at $50 per week at select locations, but other spa options can cost upwards of $230 per week, and that range in price is just for our company. Do your homework! Salon booth rental prices can vary considerably. And it is all included in our weekly leasing price. Compare those offerings with the companies you investigate. Amenities can be costly. Equipment alone can be a game-changer. So many of our clients simply do not have the money to pay for equipment or an assortment of overhead expenses; that’s what makes Salon & Spa Galleria so special. And one other consideration . . .
Is the company you are checking out locally owned and operated? This is important! If you have a problem, you sure don’t want to deal with some customer service rep 2,000 miles away. You need your problem handled immediately because, as in any business, time is money. Working with a locally owned and operated salon booth rental company saves many future headaches. And that should be enough to get you started. As we mentioned earlier, you can contact us if you have more questions. 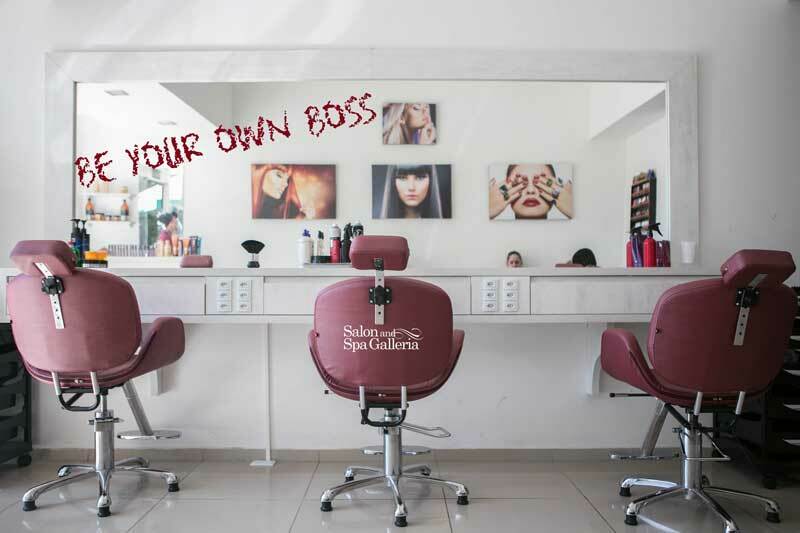 We are Salon & Spa Galleria, and we are revolutionizing the spa space for rent business model. It has worked for hundreds and it can work for you as well.